Super 35 CMOS 4K Image Sensor. The GY-LS300 features a JVCKENWOOD AltaSens 4K CMOS Super 35 high sensitivity image sensor uniquely combined with an industry standard Micro Four Thirds (MFT) lens mount. The single chip CMOS sensor has approximately 13.5 megapixels and achieves a standard sensitivity of ISO 400 with a total of 12 stops of exposure latitude. Super 35 Cinema lenses may be used and will retain their native angle of view. 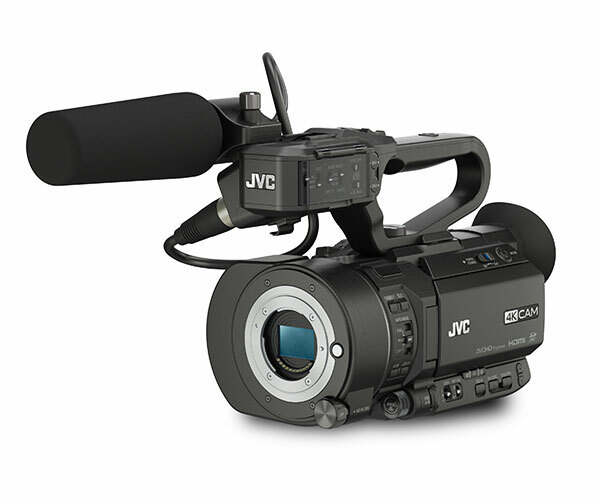 * When the camera is used with MFT, Super 16 and other size lenses, JVC's proprietary Variable Scan Mapping feature will maintain the lens's native angle of view. This gives filmmakers the flexibility of using widely available MFT lenses as well as high end cinema lenses. It is also possible to attach the camera to microscopes and other devices using a MFT/C-mount adaptor. The unique combination of the MFT mount, the larger S35 image sensor and Variable Scan Mapping give the camera nearly limitless lens options. 4K Ultra HD Recording at 150Mbps and Live Output. Working with 4K has never been easier! Insert an SDHC or SDXC (UHS-I Speed class3) memory card and record hours of 4K Ultra HD (3840 x 2160) material. Recordings are made using the Quicktime (.MOV) file format and are compatible with many popular editing systems. Connect a 4K Ultra HD monitor with a single HDMI cable, and view the camera's live 4K signal. You can also play back recorded files directly from the camera. The GY-LS300 also downconverts UHD signals to standard HD for output through the built-in SDI or HDMI connectors. 4:2:2 Full HD recording at 50Mbps. 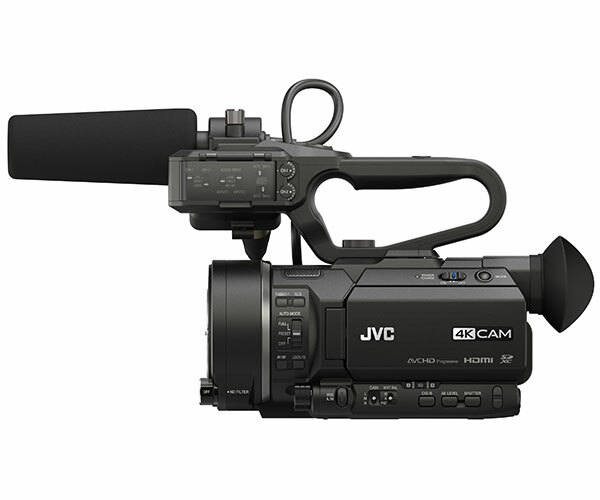 The GY-LS300 records 4:2:2 HD signals up to 60p at 50Mbps making it an ideal camera for general HD production work. 50Mbps files are stored in the Quicktime (.MOV) format for easy editing. Conventional AVCHD (4:2:0) recording is also possible, providing wide editing compatibility in an array of standard HD and SD formats. Dual SDHC/SDXC Card Slots. Dual SDHC/SDXC card slots make the GY-LS300 a truly versatile camcorder, offering such benefits as simultaneous recording and relay recording. In relay recording mode, you can shoot continuously and seamlessly over multiple cards. When one card is full, the camcorder switches seamlessly and automatically to the other card. And because cards are hot swappable, there is in effect no limit to the continuous shooting time in any mode, even with lower capacity cards. Web Friendly (Proxy) file formats. Lower resolution H.264 files (480 x 270p, 960 x 540p, 720 x 480i, 720 x 576i, or 1440 x 1080i) may be recorded simultaneously with full HD files. These files are significantly smaller than HD files, and thus are very suitable for immediate posting to the web. A file recorded in the 960 x 540 mode is approximately 1/10th the size of a full HD file recorded at 35 Mbps, and therefore takes a fraction of the time to post. The smaller files may be quickly imported to an iPad for easy editing using iMovie or Pinnacle Studio. Transporting video to the web or back to the studio has never been faster. Advanced IP Network Communication and Streaming. The GY-LS300 features JVC's latest IP communications engine giving you remote control and monitoring of vital camera functions from a tablet, smartphone, or computer anywhere in the world. Live streaming is possible in HD or lower resolutions, depending on available bandwidth. JVC's Advanced Streaming Technology (AST) includes Zixi powered Forward Error Correction with ARQ, delivering high quality streams even under challenging conditions. And now RTMP protocol makes it easier than ever to deliver your live streams to content delivery networks such as USTREAM and YouTube. Just press one button and you're streaming to the world!